Safe Chlor BBS - Baby Bottle Sanitizer. We are betrothed in providing an extensive collection of Baby Steriliser. Our product is available in the market at reasonable rates. Our reputed entity is engaged in supplying Baby Bottle Sterilizers. In order to meet excellent quality standards, we are supplying Baby Feeding Bottle Sterilizer. In order to meet excellent quality standards, we are supplying Baby Bottle Sterilizer. The B-Well Steam Steriliser has been designed to support busy mothers. 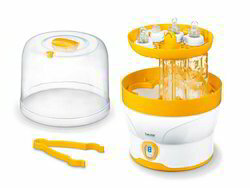 Specially designed sterilizer by Medela reliably disinfects feeding bottles and accessories for breastpumps and frees them from germs.